This post is the final one in my How to Journal series from another blog. I thought it was a suitable transition post, as My Cozy Book Nook is now my primary blog. Last week I shared my Travel Bucket List – one that I’m sure will change and grow over time. Today I will discuss how I document my travels … and how these same techniques can also be used to document my life journey. I owe much of this content to Dave Fox, author of Globejotting: How to Write Extraordinary Travel Journals, a book I highly recommend! I refer to this resource at least once a year, and each time I find a new nugget to incorporate in my own journaling routine. Pre-Journaling: when you journal your plans for the trip, your expectations and anticipations. In the Moment: when you journal while on the trip, speed journaling a few minutes at a time. Re-Journaing: when you journal several months or even years later, revisiting these essays and discovering meaningful themes or lessons learned. I love to research and plan, plot and scheme. So this kind of journaling comes naturally to me. I use this pre-journaling process to brainstorm ideas of places to go and things to see. I create draft itineraries to maximize the use of time. I collect web addresses and phone numbers for easy reference. All of this is usually part of a single subject notebook that I’ve dedicated to the trip. However, for those who can’t be bothered with such detailed research, I would suggest taking time to journal expectations (are they reasonable?) and anticipations. I find this helps me prepare contingency plans – just in case. And creating a heightened sense of anticipation helps me visualize the event. I can see myself at the site, with the crowds, experiencing the culture. This makes the actual experience more meaningful. Life’s journey application: what are you anticipating? are you excited? nervous? fearful? Journal through the emotions and try to view the situation from multiple perspectives. You may find this helps you discover contingency plans – just in case. You may find calm in the midst of chaos … or heightened excitement for a special milestone moment. This is a tricky area. On the one hand, I want to journal all that happens because I don’t want to forget a thing. However, I don’t want to journal so much that I miss the experience. Dave suggests speed journaling, which I translate as bullet-journaling. Don’t bother writing complete sentences. Often just a word or two is enough to recall the entire experience when you return home. Carry a notebook with you at all times and jot down sensory details as you experience them: sight, sound, smell, taste, and touch. Before going to bed, briefly list the highlights of the day. These brief entries are all you need to recreate the trip in detail at a later date. Life’s journey application: I know several people who want to journal but have convinced themselves they just don’t have the time. They imagine a “right” way to journal: it must be maintained every day – in complete sentences – grammatically correct – thorough and comprehensive. No wonder they never start! Remember: there is no one right way to journal – and we need to gives ourselves grace. When life is chaotic, just jot down a bullet point or two. Focus on highlights of the week and sensory details. That is all you need. These will help you document life, as well as give you some perspective. I don’t know about you, but I always experience a let down when the trip is over. I spend so much time anticipating the trip, that the actual experience seems a blur. Did I really do that?! Fortunately, I have my photos and journal to prove otherwise. Once the laundry is complete, and we are back into the everyday routine again, it is nice to review my notes and formulate longer, more thoughtful entries. Invariably the most stressful moment of the trip makes the greatest story – and it is this delayed response that allows a more accurate retelling of the event. And often the most anticipated event is not the highlight of the trip. I like taking a few days (or weeks) to allow the memories to settle before I craft them into essays. Life’s journey application: time always allows for reflection and perspective. Don’t be reticent to revisit an old memory. Sometimes the pain is too great to see the situation for what it really is. Sometimes extreme joy causes us to see the world through rosy colored glasses. Jot down the feelings as you experience them… but then consider reviewing at a later date for a more objective point of view. Dave Fox is a professional writer, so post-journaling represents potential articles he might sell to a magazine or website. Re-journaling is an opportunity to review those articles several years later and reflect on lessons learned over time. Life’s journey application: I am not a professional writer, but I know that time heals wounds (maybe not all wounds, but many of them). Time softens life’s hard blows. Time helps us see how all experiences – good and bad – work together to help us grow and mature. In addition, I am a firm believer in the “stepping stones” of life – that is, one experience leads to another and another. Re-journaling allows us to review our past in the context of life as a whole, rather than as an isolated event. Perhaps we can discover the why behind the event – or the lesson learned that will help us navigate a different troubling time. Re-journaling gives us time and space to review. As Socrates said, “An unexamined life is not worth living.” Re-journaling allows us to examine life – to discover common themes or patterns that would otherwise remain hidden. What choices or behavior robs us of joy? How can we eliminate them? And conversely, what choices or behavior brings us joy – and how can we cultivate them? I love travel, and I love journaling even more. These Globejotting techniques help me focus on both – and gain perspective on this journey called life. I love this "Invariably the most stressful moment of the trip makes the greatest story." Sort of happens that way spiritually, too. I think I spent about two hours in the Basque region way back in 1977 when I visited France for the first time. How exciting for you! 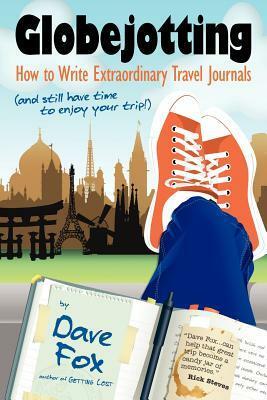 I'd love to hear how you like the Travel Journaling system.